Hail Replaytm is our all new comprehensive SUPER-RES radar replay tool that allows you to view / play back the hail frame-by-frame in ~2 to ~3 minute increments. 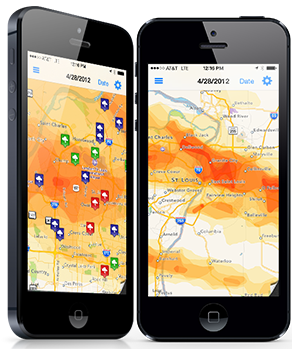 Use it to visualize hail volume and duration, and easily pick out the areas with more damage. Check out the demonstration video here. All Hail Replay packages also include an additional full-access seat - 2 simultaneous Hail Recon users and 2 simultaneous full screen browser map users (normal accounts have 1 Hail Recon and 1 browser map user). Call us for more details @ (512) 994-2550 - we can show you all about our latest technology. Your email/password has been used to sign in to a different computer.